I get a lot of questions about how to set up a calm down kit. Short answer... there is no wrong way! What is a Calm Down Kit? 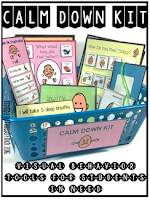 A calm down kit is a kit full of visuals and tools to help students cope with their emotions in a positive and safe manner. Where can you set up a calm down kit? ANYWHERE! 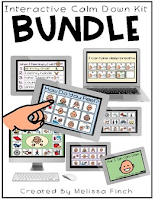 Depending on your student's and schools needs, you can create multiple! It is beneficial to have a calm down kit in all classrooms, the school office, the counselor's office, psychologists office, speech room, cafeteria, playground, the bus...really...everywhere! You can also simply just keep one in you classroom and teach students to report back to the room when needed. If you need a more portable version, you could consider an interactive calm down kit on a tablet or a calm down kit on the go. Who can use a calm down kit? Anyone! 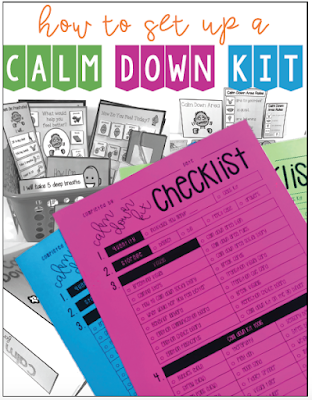 A calm down kit is not just for students with special needs. 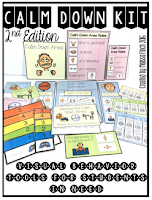 A calm down kit can be used with any child who has trouble coping with emotions. These tools can help students to become independent in resolving conflicts, troubleshooting issues and managing personal emotions. What goes into a calm down kit? Well, that depends on your students needs. This is when teacher planning comes into account. Will you be setting it up for an individual student? Will it be a class resource? A school resource? Will your calm down kit be mobile? All of these answers play into how you set yours up! I am going to go over a few options below, but just know there is no "wrong" way to use a calm down kit! Next, choose which visuals from my calm down kits you will need. These packets include a variety of tools, but there is no need to prep them all if you don't need them! Every class has different needs thus will need different visuals. To see a preview of each visual included, read more HERE. Now, it's important to note that you do not need to use these visuals in a "calm down kit" if you only need one component for one student. Do you have a student that struggles with communicating emotions? Below are a few samples of how you can adapt the calm down kit visuals with a simple pencil box to create a portable emotion tool! Do you have students that struggle to maintain calm breathing when angry? My favorite visual can be adapted for a portable breathing kit! Simply tape the visual to the pencil box and place the breathing visual inside. You can also store other breathing tools such as bubbles, a straw, and pom poms. Create breathing activities on the go. For example, have students blow through a straw to move pom poms from one end of the table to the next. Have students blow 10 big bubbles. Do your students like pinwheels? Have them blow a pinwheel to make it spin! Do you work on teaching emotions in your classroom? 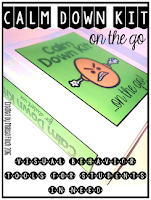 You can print a duplicate copy of the calm down kit for a small or whole group lesson. I love to pair my emotion visuals with these fun emotion stress balls for fun matching and communication activities. With these tools, there is no limit! If you are looking to set up individual calm down kits for students that are personalized for each student, consider using sterilite containers with lids. They stack PERFECTLY if you want to store them all together when not in use. 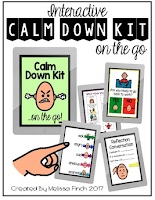 Below are "interactive" calm down kits that have the visuals of the calm down kits above in an interactive format that can be used on a tablet of any kind. Just open in any PDF reader!